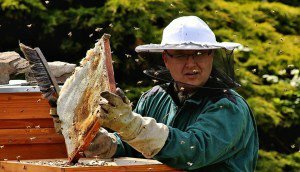 Roman Linhart on beekeeping: against nature? I have always argued that beekeeping is not a craft, but it is an applied science. That is why I have always tried to look at bees as a biologist. An effective method of beekeeping in the 21st century must be strictly derived from understanding the biology of wild bees. Otherwise, we can not achieve the goals and using unnatural methods of beekeeping we only harm them. Strange in the global development of beekeeping is that although we know more and more about the particulars of swarming and diseases, yet paradoxically, that does not lead to a better life in our breeding colonies. The degree of knowledge in beekeeping has increased rapidly during the last decades. Yet it negatively correlates with the state of the apiculture industry in practice. The more we know, the worse the condition of the bees we have. Consider that where bees had lived for hundreds of years in natural cavities and later, after the rise of civilization in primitive ancient and medieval hives made of straw and hollow billets kept by illiterate villagers, we have now a problem to keep our bees alive in modern hives, despite of application of drugs and feeding with sugar. Keeping bees alive today is a problem even for experienced professionals. How is it possible that before even illiterate people, who knew nothing about zoonotic diseases and even less about the details of their repression, kept bees successfully? Why today even prominent and highly educated breeders of mother bees fear plague and varroa desperately? Today experts in beekeeping know much more than their predecessors in past centuries. We have read the honeybee genome, distinguished their race, we breed honeybees carefully. We know almost everything about what the bees do inside hives. Thousands of scientists explore bees every day from many different aspects. Astronomically high amounts are drawn from state budgets on honey bee diseases research. We apply modern drugs, we have modern hives, we use increasingly sophisticated diagnostic and preventive measures. We use modern information technologies in research and to exchange information and views. We publish beekeeping magazines and thick beekeeping books. We have worked out a system of treatment of diseases and highly educated veterinary doctors make decisions about how to treat the diseases. We have even sent bees into space. The result of this highly sophisticated and versatile care of a honeybee by a man is paradoxically threat of mere survival of populations of bees in the country. Even in post-socialist countries of Central Europe, where the state of nature has significantly improved over the past 25 years. And paradoxically, the more the state of health of bee colonies deteriorated. Nice evidence that we are doing something wrong. We can no more blame our beekeeping failures on natural factors only. The main problem is not in nature, but on the side of us – beekeepers. It is us who make some basic mistake. Therefore, if we want to change the present situation, we have to admit it first. We have to rethink our beekeeping methods and practice, carry out a tough technical revision. Our methods of practical beekeeping are built on theoretical foundations developed by apidologists, but are these foundations really that solid? The more money we put into the research of artificial technologies, more we enslave the bees, more unnatural, commercial technologies we use, the less vital bees we have. The chance of losing the bees increases. Beekeeping research should on contrary always be based on understanding the biology of wild bees. Beekeepers deal with many problems. But I believe that at present there are three problems that trouble every beekeeper: swarming tendencies, American foulbrood and Varroa destructor mite. Speaking both as a scientist and practical beekeeper, I have studied these three problems systematically for 25 years. I discovered extremely effective solutions and come to share my knowledge with you. So that colonies can flourish all around the world and bees do not suffer and perish. Many of my working methods have been applied in commercial practice already in Central Europe and have helped save time and efforts of thousands of beekeepers. Above all my methods help bees primarily. First I want to talk about the method of complete elimination of swarming tendencies simply by adjusting the ratio of drones against female workers. Secondly I want to talk about reasons why wild bee colonies do not suffer by foulbrood, and third, about highly efficient methods of eliminating Varroa mites without chemicals. Some of the passages in the coming posts will be based on the results of the research published in cooperation with Professor Vitezslav Bicik and Professor Jiri Vagera from Palacky University in Olomouc.